On the occasion of F.C. St. Pauli’s return to the Bundesliga, we send a big hello to hamburg and to one specific Fan Club: Deaf St. Pauli. 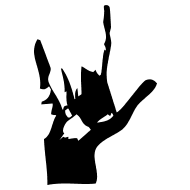 We especially like their new logo, which combines the classic St. Pauli skull and crossbones with the Deaf Sign I L Y.
ILY is the internationally known in Sign language and stands for “I Love You”. It is at the same time a statement and declaration of solidarity for the Deaf Community and to Deaf Culture in general. This entry was posted in deaf, pop culture. Bookmark the permalink.